Over a year ago, millions around the world who love animals, became fascinated about the German Zoo story of the abandoned baby Polar bear cub that was to be named Knut. What was also interesting about this story was the Zookeeper Thomas Doerflein who became Knut's guardian and play-time friend. As Knut grew, the Zoo Director felt that it was too dangerous for Thomas to continue to play with Knut as this giant Polar bear, even in the height of play wrestling, could have seriously hurt the man. It was an understandable concern, but I think it was a bit too cautious of a concern. Eventually, after arguments to have visiting time with the bear, the zoo director cut all ties between Thomas and Knut, and as it is reported today, Mr. Doerflein was found dead in his German flat. In many months, since Thomas has been prevented to play and visit with Knut, the bear has demonstrated a bad temper and has been referred to as 'psycho bear'. Now Knut will never again see Thomas in this lifetime and it's sad to think about what will happen to Knut now that he has been hand reared by humans and cannot possibly live with his kind in the wild, let alone in the same pen at the zoo. Originally, protesters said that Knut should have been killed to prevent harming him by being raised by humans, and now this. So what will happen to Knut now? It's dreadful to think about. This story reminded me of Michael's movie, 'A Bear Named Winnie', which I saw early on in my learning-about-this-Michael-guy phase and I loved it so much. The bonding between the bear cub and Michael's character was so sweet and enduring. 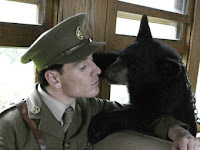 And there is a moment in the film that after Lt. Colebourne and the bear were separated, the Lt. went into like an unresponsive shock state and was hospitalized. This is all based on a true story. So I can't help but think about the natural bonding that can occur between people and bears, especially as the bear is a young cub. And when the person and the bear are separated, they both undergo serious psychological distress. If you have not seen 'Winnie', I suggest you mosey on over to the amazon.com link on the sidebar and click on the Winnie link and check it out. It's a wonderful film. review. If you live in the NYC area, do please go see this movie at the Lincoln Center on September 27 and 28th.